When I was a teenager with a new driver’s license growing up in Havre de Grace, I reached every destination via Tydings Park. It didn’t matter if I was heading from home on Weber Street (aka “the project”) to work downtown or to the mall in Bel Air, I was going to drive through the park on my way there. By this time in the late ’80’s, teenagers weren’t permitted to loiter, er, congregate in the yacht basin so I’m not sure what my goal was but I still circled the park daily in my dad’s El Camino or, later, my AMC Concorde. 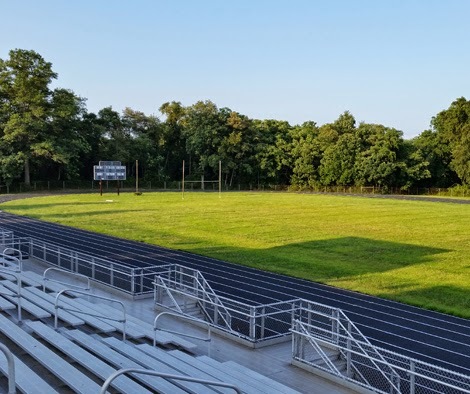 With such a track record, it doesn’t seem quite so weird that I’ve been cruising through the parking lot at Perryville High School during the last few months. I’ve tried to pass through when the parking lot was empty to keep the rumors to a minimum but I have to admit yesterday morning I was surprised to have been seen by several people as I was making a drive-through on my way to work. Since they broke ground in May, I’ve been dying to see the new track at the high school. I stopped a few times and all but pressed my nose through the fence to get a better look and checked each entrance to make sure that the track wasn’t accessible to the general public. It was even one of the reasons I attended graduation in June. Tonight I had a few minutes to kill so I took another pass through the parking lot in hopes that the gates would be unlocked–and I was in luck! 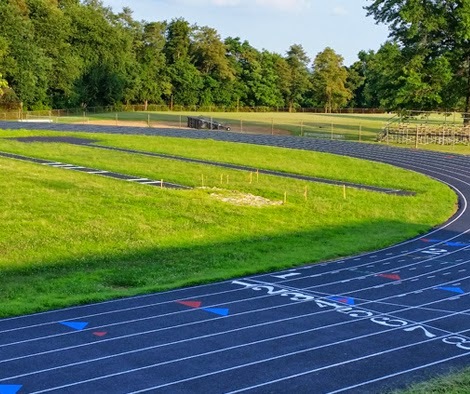 Four months after I took my first photos of the disintegrating track surface at Perryville High School, I was able to walk on a pristine track! Feast your eyes on these sights! 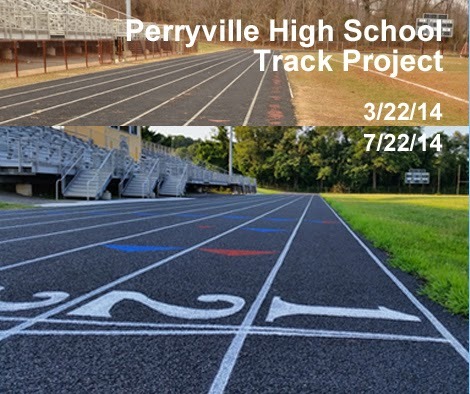 Paving at Perryville High School–Yay!